GRAND RAPIDS, MI – Rorey Shepherd is ready to start rebuilding his life, if not a home in your neighborhood. 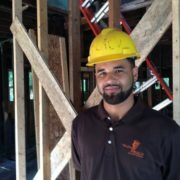 Shepherd, 24, is one of 15 students graduating this week from Youth Build, a seven-month program that gave him his high school graduate equivalent degree and construction skills that he plans to carry onto a career. Besides teaching him life skills and construction skills, the program and its counselors also helped him get through personal issues, Shepherd said. “It’s been a complete turnaround,” said Shepherd, who said he wants to eventually pursue a career in construction management. Those lessons began in a foreclosed and abandoned old frame house on Ford Avenue NE, where the Youth Build students stripped the interior down to the studs in preparation for a remodeling job. For Jameilla Ross, it meant spending cold, wintry days stripping the kitchen of the old house of its cabinets, plumbing, plaster and insulation. Whether that dirty work leads to a career in construction is not clear, said Ross. “I will use it to my advantage if something breaks in my house,” she said. Another student, Whitney Penn, shuddered as she recalls sawing pipes out of the basement of the old house. Penn said she now is hoping to pursue a career in construction administration and ultimately, politics. The house, which was acquired from the Kent County Land Bank, is being rebuilt for Urban Transformation Ministries and its Man Up program, said Ryan Nettesheim, youth services department supervisor at Bethany Christian Services, where the Youth Build program is based. Nettesheim said the Youth Build program has been more successful than most in preparing its students for college and careers. Of the 21 students who began the program seven months ago, 15 will graduate this week, he said. Tryouts for the next seven-month Youth Build program will begin in July, Nettesheim said. The two-week tryout program, dubbed “Mental Toughness” is aimed at finding participants who are serious about getting their life on track, he said. Students interested in participating in Youth Build are invited to attend weekly orientation sessions on July 8, July 15, and July 22 from 3 p.m. to 4:30 p.m. Orientation sessions also are offered on July 10, July 17 and July 24 from 5:30 p.m. to 7:30 p.m.
More information is available by calling Youth Build Grand Rapids at 616-284-3283.